After three years of striving to create the perfect party, PT Events have reaped the rewards of their efforts during the Third Birthday of Grotesque. The 4th year of Grotesque has flown by in a whirl of sold-out club nights and jam-packed stages at Electronic Family, Ultrasonic-, Summerlake- and Nature One Festival. 2013 is already a successful year for Grotesque, but the best is still to come……. The clubnight Grotesque has in just a few short years become one of the more influential nights on the scene. Their very own Indoor Festival is adding yet another exciting chapter to the success story and the organisation seems unlikely to stop the happy ending just there! So what makes Grotesque so special?? Grotesque has always tried to distinguish themselves by catering to the clubbers’ ultimate perception of enjoyment. They spend extra time and energy on those little details that make their clubbing experience stand out from the rest. Experiencing a Grotesque night will leave you with that wonderful ‘so it can be that good’ feeling. The Maassilo in Rotterdam, grandiose but still intimate! PT Events has always searched for exceptional locations in order to give their parties that intimate feeling on a large scale. The Maassilo was certainly put through it’s paces during the packed-out success that was the Indoor Festival of 2012. Not only was the location perfect, the staff at the Maassilo really added to the mixture of like-minded clubbers. PT Events are convinced that this stunning location will yet again be perfect for the Grotesque Indoor Festival 2013. The 100-yer old grain silo exudes a tangible robustness from it’s engine rooms, bringing an authentically personal vibe to it’s large open spaces. Grotesque will bring the true festival spirit to the indoor arena with lots of entertainment and other things to spark your senses, aside from the music. In The Maassilo everyone is free to build their own unique festival experience. Take a sneak peek at the super cool Buddha Lounge, completely furnished by Milovito, a true specialist in glass mosaics. We will again be hosting the Oxygen Bar 3D Experience, and there will be an exciting new feature this year. The sights and sounds that flow through the special 3D glasses will be streamed direct from the DJ booth in the main stage, allowing you to experience exactly what it’s like to be the DJ. A totally new element in the Oxygen Bar and well worth a try!! The festival feeling, great, but the party still needs to lift the roof! Absolutely! Grotesque is gonna be banging! This year there will be no less than 4 big rooms for the many faces of music which will make up the festival. That means there truly will be something for everyone. 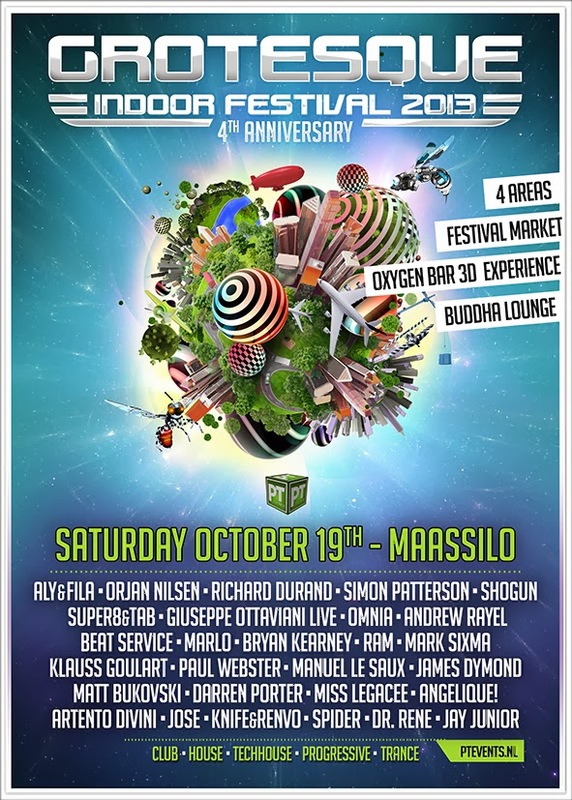 Of course, there will be two big rooms with headline acts such as Aly&Fila, Orjan Nilsen, Shogun en Richard Durand. But you will also get to see other aspects of the Dance music genre that make it so great. Taste the festival atmosphere with the sultry vibes in the House area or let yourself go crazy to one of the 140bpm Trance giants, this year with their very own area for all those that love the harder side of trance. The Grotesque Indoor Festival 2013 will also play host to a dazzling array of market stalls, the perfect place to rummage around and find a special something to remind you of this unique festival experience. Have you already checked out the official website? Come take a look at the multifunctional website of the Indoor Festival. This site was set up especially for people who want to download a special guestmix, read interviews with the DJs or get info about nearby hotels and transport options for the Maassilo. There are also some cool Grotesque competitions and you can stay up-to-date with the latest news….including additions to the festival market. RAM's Memoriam set for his wife Amelia! Probably not many people have missed the terrible news about the sudden passing of Rams wife Amelia, last Saturday. Only one tough week later, Ram is determined to perform and focus on his own Indoor Festival where he will dedicate a special dj-set to his wife Amelia. This tragic happening won't have much consequences for the Indoor Festival, only the dresscode will be changed to "White". Dresscodes are always a wish from the organisation; it will never be a restriction. Grotesque Radio #100 Live Broadcast The 100th edition of Grotesque Radio will be a very special one! AfterhoursFM will be broadcasting directly from the Mainstage of the Grotesque Indoor Festival on the night, with all other stages being broadcast at a later date, Check www.ah.fm for the livestream and more info on registration. Conclusion: Just €40 will get you entry into the Grotesque Indoor Festival 2013 and the choice of nearly 30 top-quality artists. As well as enjoying free ice creams, fruit and sweets, you’ll also get one hell of a festival experience to take home!